The Society of St Vincent de Paul (SVP) has urged the Government to mark the centenary of the 1916 Rising by living up to the pledge at the core of the new nation: equality for all citizens. Government action today had meant: “.. disabled people have suffered withdrawal of services and cuts in grants, the health services are not fit for purpose, it is becoming horrendously expensive for families to educate their children, and to meet daily living costs….” Tom MacSweeney commented. He said those who advocate more austerity are well off, in influential positions, and have insufficient concern for those suffering from policies of austerity. They do not to have to seek help from charities to buy food, to pay energy, utility and mortgage and other bills. SVP National President, Geoff Meagher, also warned that social justice must be at the centre of a nation. He continued, “Now is the time to discuss what matters most to a nation – its people and the situation in which they live, work or in many cases try to exist without work,” he stated. Geoff Meagher added that it is time to discuss the changes needed, and to prepare for when the nation begins to emerge from economic difficulties. “We should learn the lessons from the “economic disaster caused by an unequal society,” he said. He suggested that everyone should be involved in this debate – Government, politicians, employers, trade unions, NGOs, charities, other social justice partners and individual citizens. “Thanks to the recession people’s lives are now controlled by an ever smaller group of people, and this cannot be good for democracy,” he said. “As we approach 2016, what better way to celebrate our 100 years as an independent nation than to commence that debate now?” Geoff Meagher concluded. 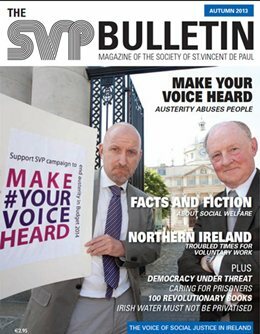 One statistic SVP highlights is that approximately 733,000 people live in poverty in Ireland and 232,000are now at risk of poverty.